I’ve been thinking about horror again, as a genre. I’ve been trying to read some Cthulhu stuff; I’ve reread some Image and Marvel horror comics; and I’ve also recently read Ellen Datlow’s Best Horror of the Year #8. Lots to mull over. And a newer Marvel series I read was Carnage, the first 11 issues, by writer Gerry Conway, artist Mike Perkins and colorist Andy Troy. Carnage is new territory for me. I’m not much of a post-Ditko Spider-Man reader, and I was slightly too old in the 90s to cotton to those incarnations of Venom and Carnage. So, fast-forward to 2015 and 2016 and me catching up with Venom Space-Knight and Carnage. If you’ve never met Carnage either, he’s an offspring of that symbiotic black suit that Peter Parker returned home with after the original Secret Wars. The symbiote went on to have its own stories sans Spider-Man by covering a new host. In the early 1990s, a darker character was needed, so they had the symbiote…. fission… to create a new symbiote that wrapped itself around psychopath and homicidal sadist Cletus Kasady. 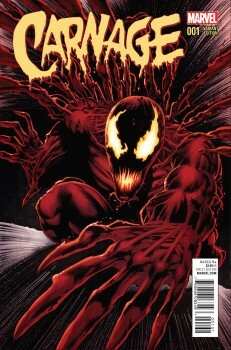 Carnage played villain for a while and then disappeared with only some minor surfacings until this new series in 2015. I wasn’t sure what to expect of a series centered on a serial killer. How much can you do with a single serial killer? I decided to give it a try anyway, and was very pleasantly surprised, and in fact, Carnage is turning into one of my favorite Marvel titles. I was a bit lukewarm on the first two issues though. I chalked it up to me just picking up the vibe of the series. However, the quality was obviously there. The art of Perkins and Troy was more than half the reason I stuck with it. I love very realistic art and vast visual scapes, and they delivered both. And although I didn’t understand any of the large cast they were assembling (other than Colonel Jameson, J. Jonah Jameson’s son, whom I knew was also Man-Wolf), there was lots of conflict and I felt in competent hands. And from a purely horror perspective, I wasn’t sure how much of a horrific story this really was. In issue 2, the editor Darren Shan talked about this being a Marvel horror book, but frankly, I didn’t see it as being much more than a bit of a slasher-type horror, which doesn’t do much for me. Lot of people died in this panel. This was the first I’d seen them though, so my reaction was limping. 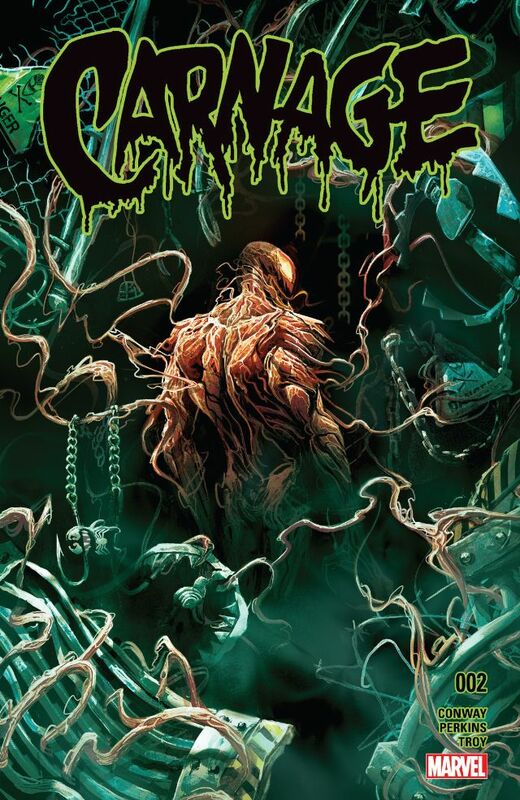 Carnage has beautiful cover and internal art. Nobody who died in the first couple of issues was in any way a character, so there wasn’t much to feel as a reader, other than a bit of dislocation with no one to root for. Issue 3 hooked me though. By now, we had a clear cadre of monster hunters, including Man-Wolf, Toxin (another symbiote – just go with the fissioning), Montesi (an old Marvel character associated with Dracula) and some government and academic people. Not only this monster-hunting focus reminded me of the old Marvel Tomb of Dracula stories, but by issue 3, we got the Darkhold! Marvel has had some different origins for vampires, but in my heyday of collecting (the 1980s), the Darkhold was the key that made them and could possibly undo them, as it did in Dr. Strange #62. The Darkhold and Dr. Strange were also the entry-points for a lot of the Cthulhu-flavored influence that got into Marvel. And I was delighted to see in the third issue an underground temple. And structurally, I noticed a series of haunted house stories, done quite effectively. The monster-hunters either fight Carnage or Carnage hunts: (a) in a demolished and crumbling mine, (b) on a small sail-boat, (c) in a big freighter, or (d) on an island. The classic haunted house story always restricts everyone’s movements, traps them in a closed space, multiplies the horror of the monsters, and lets the story go. And that’s what Conway did here. 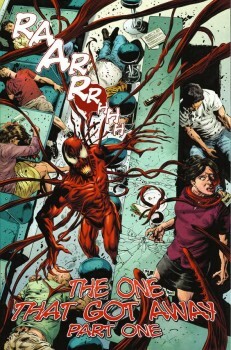 I really enjoyed my binge-read of the Carnage series up to the present issue (#11). I’m going to keep coming back to it. Derek Künsken writes science fiction and fantasy in Gatineau, Québec. He tweets from @derekkunsken.